This is the only auction that I had a chance to preview this fall, but I got to see a great selection of bottles as always. The auction began and ended on high notes: Lot 1 was an exceptional G1-73 Baltimore Glass Works General Taylor and Fells Point pint in a pink amethyst – a color that could only come from Baltimore. It wasn’t that many years ago when this probably would have sold in the Pollard sale for about 5 grand. This one brought $25,000. The last lot, Lot 100, was in fact from the Pollard sale – it was a GI-19 in a copper amber color and brought $8,000. Clearly historical flasks are the hot item right now with consistently strong prices. The heck with the down economy, everyone is still eager to get the best that money can buy. 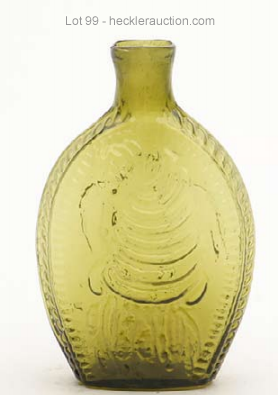 The highlight of the auction was lot 99 – a GII-69 Eagle Cornucopia in yellow olive with just the perfect coloration. The color simply glows. Bidders agreed and ran the hammer price up to $39,000. Lot 36 was eagerly anticipated by New England collectors – the GX-27 Granite Glass Works “Stoddard Flag” closed at $21,000, a price which reflects both the high demand for flasks and the particular interest in this iconic piece of Americana. Free blown and utility glass was perhaps a bit weak across the board – a group of snuff bottles brought $1500 and a set of nine graduated chestnuts just $2500. Prices realized for these items were not unlike those seen a decade ago, showing that there are at least some good buying opportunities out there.